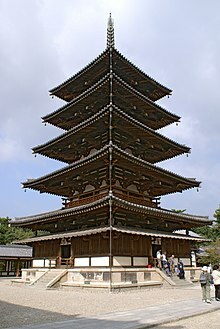 Widden five-story pagoda o Hōryū-ji in Japan, biggit in the 7t century, ane o the auldest widden biggins in the warld. A pagoda is the general term in the Inglis leid for a tiered touer, biggit in the tradeetions oreeginatin in historic East Asie or wi respect tae those tradeetions, wi multiple eaves common in Nepal, Indie, Cheenae, Japan, Korea, Vietnam, Burma an ither pairts o Asie. Some pagodas are uised as Taoist hooses o worship. Maist pagodas wur biggit tae hae a releegious function, maist commonly Buddhist, an wur eften locatit in or near viharas. This term mey refer tae ither releegious structures in some kintras. In Vietnam an Cambodie, due tae French translation, the Inglis term pagoda is a mair generic term referrin tae a place o worship, altho pagoda is nae an accurate wird tae describe a Buddhist vihara. The modren pagoda is an evolution o the Auncient Nepal stupa, a tomb-lik structur whaur saucrit relics could be kept safe an veneratit. The airchitectural structur o the stupa haes spread athort Asie, takin on mony diverse furms as details specific tae different regions are incorporatit intae the oweraw design.